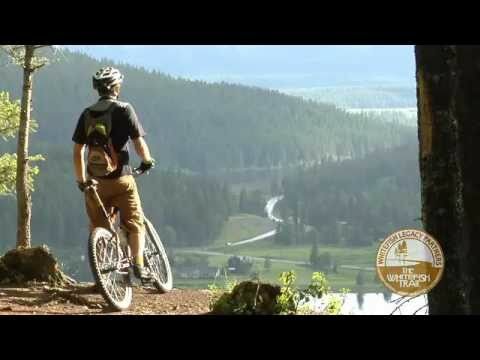 The Whitefish Trail is a user supported, community-driven asset providing 42 miles of natural surface trails and 12 trailheads/connectors located in a forested, rural environment. The diverse trail system is appropriate for outdoor enthusiasts and families including hikers, dog walkers, mountain bikers, horseback riders and runners of all abilities. The Whitefish Trail is a regional, multi-partner project to develop a 55-mile recreational trail system looping around Whitefish Lake through state, federal and private lands, creating a regional amenity that is unique in western Montana. To date, Whitefish Legacy Partners and the City of Whitefish have built seven trail heads close to town. The trail is comprised of stacked loops, scenic overlooks, beautiful single-track trail and gated logging roads. With continued construction slated over the next five to ten years, the Whitefish Trail will provide a high-quality recreational experience that links trails in the City of Whitefish and at Whitefish Mountain Resort with the Department of Natural Resources and Conservation (DNRC), Flathead National Forest, MT Fish Wildlife and Parks fishing and boating sites, Flathead Land Trust easement property, and multiple private ownership. Lion Mountain: Located conveniently close to town, the trails at Lion Mountain provide access to a scenic overlook as well as loop options for quick family excursions. Lion Mountain Trailhead is accessible off Hwy 93 North, 2.2 miles from downtown Whitefish. Turn right on Lion Mountain Loop Road. Follow Lion Mountain Loop Road to trailhead. Skyles: Not much further from town, the Skyles Connection offers quiet access to the Whitefish Trail. This trail accesses the 2.5 miles section of trail through public and private easements that provide views of the Whitefish Range and the Big Mountain. Skyles Connection is accessible off Hwy 93 North, 3.5 miles from downtown Whitefish. Turn right on Skyles Lake Lane and continue to trailhead 0.3 miles. Maximum parking 6 vehicles. Beaver Lakes: Pristine waters and beautiful forests have inspired families for generations to fish, hike and camp in quiet seclusion. Three trailheads in the area provide numerous options for long excursions, scenic vistas, or shorter loop hikes in this beautiful multi-lake basin. Beaver Trailhead is accessible off Hwy 93 North, 7.5 miles from downtown Whitefish. Turn right on Beaver Lake Road, continue 1.6 miles. Access to North Beaver Connection and Woods Lake Trailhead can be accessed beyond Beaver Lakes Trailhead. Lupfer: Head to Lupfer Trailhead for a three mile loop trail with a scenic view of the Salish Range and combination of single track trails and old logging roads. Lupfer Trailhead is accessible off Hwy 93 North, 11.8 miles from downtown Whitefish. Turn right on Lupfer Road, continue 1.1 miles, bear right at Y-intersection and continue 0.4 miles to trailhead. Swift Creek: This area’s untamed creeks, forests and wetlands foster abundant wildlife and clean drinking water for the Whitefish community. Over three miles of trail, including an ADA accessible trail, offers scenic overlooks of creeks as well as access to Smith Lake. Swift Creek Trailhead is 8.3 miles from town accessed from East Lakeshore Drive. Head north on Baker Ave. from downtown Whitefish over the viaduct. Continue as road turns into Wisconsin Ave, then East Lakeshore Drive. Pass (but do not turn onto) Big Mountain Road and continue 5.9 miles to trailhead. Twin Bridges/Spencer: The 2,500 acre Spencer area is filled with over 30 miles of user-built historic trails and gated roads that outdoor enthusiasts have been recreating on for many, many years. The area is accessed from Twin Bridges Road, KM Ranch Road, and Rifle Range Road. Cross-country cyclists, hikers and equestrians enjoy gorgeous views from the ridge tops, freeriders enjoy the adrenaline filled technical jumps and wooden stunts on trails like Spooky Pete’s, Otter Pop, and Malice in Plunderland, and the steep climbs and super fun descents make Spencer an incredible addition to the Whitefish Trail system. Please note: Trail improvements and signage are currently in progress. Currently the Whitefish Trail is 42 miles, accessible from 12 trailheads and connectors. Download the trailmap for distances of each section. View the trailmap for trailhead locations.